Floral Danielle: Avenue 32 wishlist! I absolutely love lace bras, and I have definitely missed the A/W black and burgundy colours! I need to keep my eye out for a similar one to this as I'm in love! I can't quite get my head around the fact that the top half of this dress is actually made from alpaca fur! It is a gorgeous dress none the less, and would look gorgeous with the fur gilet and leather boots! 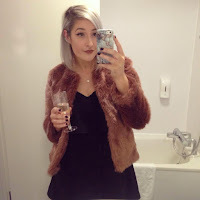 I've literally fallen in love with this fur gilet! I love the colours and the ombre effect, and after having a little stalk of the rest of Yigal Azrouel's collection, I am just in love with his monochrome style! I'm going through a real ring stage at the moment. Sometimes I love them, and sometimes I hate them, but right now I can't stop wearing them! I'm loving mixing silver and gold and these textured gold rings would go perfectly! Well if I'm going to get the rings I might as well get the matching bracelet ;)! The texture of this bracelet really reminds me of the amethyst stones that I've been loving. I really need a new pair of black leather boots for Autumn/Winter - if only I had £470 lying around! These ones are actually perfect, I love that they're leather so they'll be very durable, and the zip detailing is lovely! Had you heard of Avenue 32 before? Which is your favourite item from my wishlist? Oooooh love all of these pieces,! Shame there just so expensive! I have been wanting those Phillip Lim boots for so long! Oh my god that fur gilet is absolutely perfect, wah at the price! That dress is so so so cute! I love the shoes too! Personalised tea, especially blended for me!